The Bar Council of India (BCI) has referred to Bar Council of Delhi (Special Committee) a complaint filed by Advocate R.P. 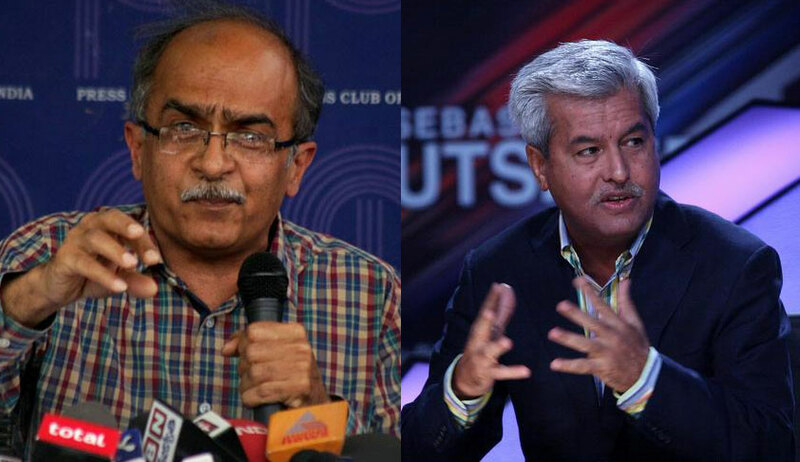 Luthra demanding immediate disciplinary action against Mr. Prashant Bhushan and suspension of his certificate of practice for "gross professional and other misconduct". This Committee has been directed to constitute a sub-committee comprising any High Court Judge, a Senior Advocate of Delhi High Court, a Senior Advocate of any other High Court and either the Chairman or any other member of the Special Committee of Bar Council of Delhi. In its resolution dated 21 January, the BCI General Council (GC) has directed the State Bar Council to ensure that the complaint is disposed of within 15 days, i.e. before 5 March. Mr. Luthra's complaint had also leveled allegations against Mr. Dushyant Dave. The GC's resolution had then requested the Chairman, Vice-Chairman and the Chairman, Executive Committee to examine the material available on record and pass appropriate directions. Thereafter, on 24 January, the trio passed similar orders in relation to allegations of misconduct against Mr. Dave as well, directing the Bar Council of Gujarat(Special Committee) to look into the matter and decide on the complaint by 28 February. In his complaint, Mr. Luthra makes reference to the petition filed by Mr. Bhushan in the medical college bribery case, highlighting the fact that it was filed despite the pendency of a similar petition filed by Advocate Kamini Jaiswal. It may recalled here that the Apex Court had dismissed CJAR's plea, observing that it was "wholly frivolous…contemptuous, unwarranted, aims at scandalizing the highest judicial system of the country". The Court had also imposed costs of Rs. 25 lakhs on it. Quoting several passage from this judgment, Mr. Luthra also raises the issue of the complaint made by the executive committee of the Campaign for Judicial Accountability and Reforms (CJAR) seeking an in-house inquiry against Chief Justice of India Dipak Misra in relation to the same case. The complaint had been made to five senior-most judges of the Apex Court after the CJI i.e. Justice J. Chelameswar, Justice R. Gogoi, Justice M.B. Lokur, Justice K. Joseph and Justice A.K. Sikri. ...We all know that such claim is baseless, but such statements and acts are badly maligning the image and reputation of our senior-most 2-3 Judges in public. And these matters have nowdays being openly discussed on media channels." He further alleges that Mr. Bhushan and Mr. Dave have been "gossiping" in the Supreme Court that a "very senior Judges" and his relative who is a High Court Judge are "managing the High Court and some Supreme Court Judges and earning huge money". This issue, he says, needs an in-house enquiry. The complaint finally states, "Therefore, I humbly request the Bar Council of India, the apex Statutory Body of Advocates to suspend the Certificate of Practice of Mr. Prashant Bhushan for whole life so that the dignity and decorum of the Institution could be maintained and such nasty activities could be stopped."